Professor John Robertson believes there should have been wider coverage of his research. An academic who released research claiming "evidence of bias" in STV and BBC coverage of the referendum has hit out at the media for ignoring his work. Professor John Robertson of the University of the West of Scotland said there had been collusion among Scotland's mainstream media and he condemned fellow academics for not supporting his work, saying it amounted to "thought control" in a democracy. However, both STV and the BBC have rebutted his views. Professor Robertson, a media researcher with 30 years' academic experience, is a supporter of independence and describes himself as a socialist, a pacifist, a feminist and an anti-imperialist. He rejects the SNP because it supports Nato membership and accuses Scottish Labour of being "fatally corrupt". He told a Holyrood committee: "I am sorry if this seems a bit dramatic, over-the-top, but it’s been a very stressful month. I would like to condemn the silence and collusion of almost all of Scotland's mainstream media in suppressing my research despite its massive online presence. Its online presence is a news item which has been ignored; I have my suspicions but I don’t know for certain. “I would like to condemn the silence of almost all Scottish academics with an interest in this field who might have been expected to challenge censorship of intellectual material. “I have been personally hurt by the above combination of threat from a powerful institution, there’s been no horse's head in my bed yet, I suppose that’s something. BBC Scotland director Ken MacQuarrie said Mr Robertson refused requests from the BBC to see the data he based his findings on. Head of news and current affairs John Boothman denied that the study had been suppressed, pointing out that Professor Robertson had discussed it on BBC Scotland's flagship morning news show and that it was debated in phone-ins. He acknowledged that complaints about BBC coverage had increased since the start of the referendum campaign but bosses were unable to provide MSPs with a breakdown of how many were referendum-related. Bobby Hain, STV's Director of Channels, said: "We have an obligation under our licence to make sure that our political coverage is always impartial, and we take that very seriously. "In preparation for the referendum, as for any political event, we make sure that we're covering the story from all angles and we're making sure that our coverage is impartial." Professor Robertson said: "I would like to condemn the behaviour of BBC Scotland's department of policy and corporate affairs in suppressing the dissemination of my research, and in circulating an insulting and ill-informed critique of my research directly to my principal. "I've been personally hurt by the combination of threat from a powerful institution, although there has been no horse's head in my bed yet, abandonment by the mainstream media and by academia other than my own immediate colleagues. I interpret the above as an attempt at thought control." Mr Boothman said the study contained "quite glaring" errors which had since been corrected in subsequent versions. "There were either factual errors about the date, people named as taking part in the report didn't take part, the end summary, what we call the pay-off, of the report were not the pay-offs that were either said by the reporters or included in the reports," he said. Mr MacQuarrie said: "We completely reject the allegations about our news coverage, as we do the questioning of our journalists' professionalism and what they have brought to air. "The evidence it presents does not support the contentions that it makes and the conclusions are based largely on flawed analysis and occasionally intuitive guesswork." He added: "We asked if we might see the raw data as we did not recognise the evidence presented as an accurate reflection of our broadcast output and the request was rejected by the report's author." Mr Boothman said: "In the past couple of years with the onset of the referendum and in relation to some stories we have done on Scottish football, there has been a rise in the number of complaints that BBC Scotland has dealt with." 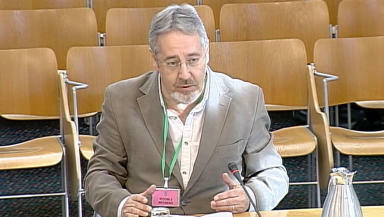 Committee convener Stewart Maxwell asked for a breakdown of complaints about referendum coverage. Mr MacQuarrie said: "The BBC Trust regularly publish the data about the number of contacts on an annual basis. Specifically, we would not break down the complaints into subject by subject areas." Professor Robertson's report alleged "a numerical preponderance of anti-independence statements over pro-independence statements by a ratio of 3:2 on Reporting Scotland and on STV". "One obvious explanation lies in the editorial decision to allow all three anti-independence parties to respond to each SNP statement, creating an unavoidable predominance of statements from the former even when these were kept short," he said. "The Reporting Scotland imbalance tends to normalise the No/anti-independence position and put the onus of the Yes/pro-independence position to justify itself. In many cases, reporters would round off with a compromise assessment so as to leave the two campaigns in a kind of balance. "Quite often, however, a statement strongly supportive of one side would be left hanging as the final thought. This was more likely, especially on Reporting Scotland, to be an anti-independence statement. "Comparing Reporting Scotland with STV News, the former seems less balanced and fair to the Yes campaign, if only in the tendency to give pro-independence statements a greater frequency of opening and closing debates. "Overall, however, both feature a preponderance of anti-independence statements, a majority of anti-independence evidence and a heavy personalisation of the debate around the character of Alex Salmond, with the latter often portrayed as selfish and undemocratic."